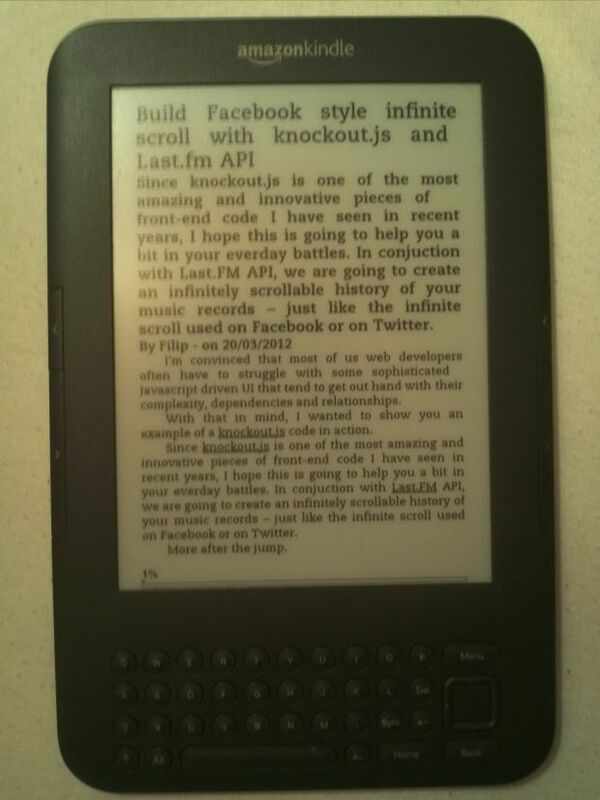 Generate Kindle (MOBI) ebooks with your ASP.NET Web API | StrathWeb. A free flowing web tech monologue. Of course to start off you need to have Kindlegen. You can get it from the Amazon website. It is very simple to use – just takes a name of the HTML file as an argument and generates the MOBI file in the same folder. Another useful link would be the Amazon Publishing Guidelines. It contains all kinds of information about how to format the HTML file in order for the generated ebook to be of highest quality. I will not focus on that at all here, as that’s not the scope of the article. In fact I’ll just use some HTML copied from this very blog, and as you’ll see Kindlegen works with pretty much anything (it just might not be perfectly sharply formatted). Our application will be a simple Web API application, off the MVC4 template in VS2010. 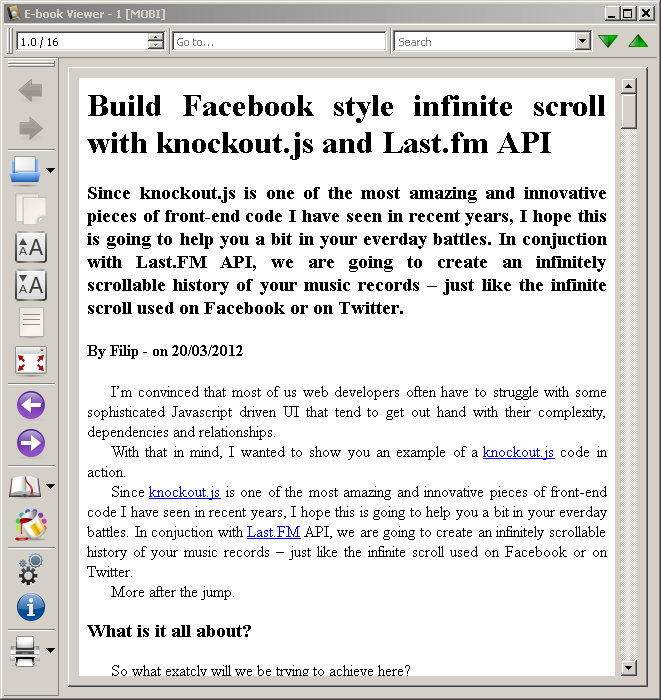 You should copy the Kindlegen tool to the root of the website, into “kindlegen” folder. Url is a typical article type of entity I mentioned before, saved by the user. Notice it implements an IMobi interface, because that will be our contract for serializing to MOBI. The IMobi interafce defines only two things it needs for creating MOBI output – unique ID (which we’ll use for naming the file) and an HTML representation of the CLR type – which will be flushed into the MOBI ebook. Our HTMLRepresentation property getter on the Url class could take all shapes or forms – in my example it will compose some simple HTML out of the model’s properties such as Title, Description, Text, timestamps and so on. You might do that using simple string formatting/concatenation and build up an HTML structure like that, or use Razor templating engine or any other templating solution you are happy with. Notice that the IMobi interface can also be implemented on collections/aggregate types to create sets of articles rather than serializing just a single article. As with any customized returned type in Web API, we”ll use a MediaTypeFormatter. So we have everything included here, except the actual serialization proccess (writing to stream). 2. We support text/html >media type and QueryStringMapping because if our controller is i.e. UrlController we want users to be able to type into browser api/url/1?format=mobi and get the file directly in the browser (without gaving to use any proprietary Content Type headers). OK for the last piece, or the show time, if you will, we will write the stream to the MOBI ebook. We will use a little hack/trick that allows us to run command line tools (such as Kindlegen) from the C# code. 1. We cast the object to IMobi, then we get the path of the /kindlegen/ folder (which if you remember we copied to our web app). 2. We need an HTML file, in order to be able to generate MOBI (we need it to be able to invoke the command line tool, in-memory representation is not enough) – so we check if the HTML file already exists on the disk, if not, we write it. 3. 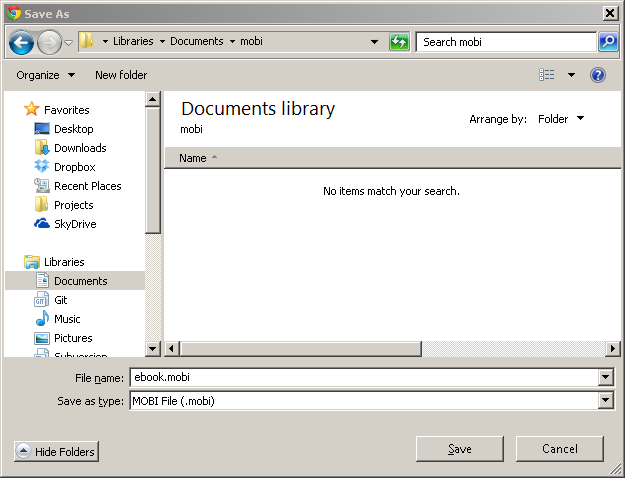 Then we check if the MOBI file already exists (perhaps it was generated earlier?). If not, we start a new process and pass the name of our HTML file to it as an argument. If the process does not return Error(kindlegen) char sequence, everything should be fine. One note here, is that this approach causes both the HTML and the MOBI file to be generated only once, all subsequent requests for the same model will result in returning the same files from the disk (think of them as “immutable”). There is nothing stopping you from doing otherwise, and regenrate the file everytime, or perhaps use a CRC to check if the HTML representation has changed (i.e. someone modified the text). Of course the formatting is not perfect, but that’s all subject to adjusting the output HTML. Generating MOBI out of CLR types via Web API + Kindlegen was just one of the crazy ideas I had this weekend. I hope you enjoyed the article, because I had a lot of fun playing around with this. And now, Sunday Football – so see you next time!